I've just returned from a fabulous long weekend in Portland. 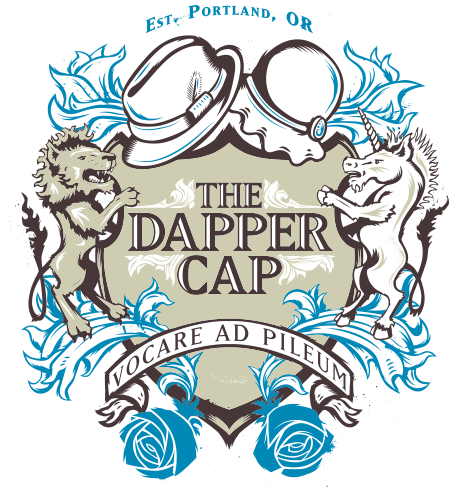 To start, let me introduce my newest retailer, The Dapper Cap. They have a wide selection, a beautiful showroom, and are just really cool and nice people to boot. Be sure to stop in next time you're in town! I'm really excited to add House of Nines to their long, international list of high quality brands, and feel a happy symbiosis coming on. I'd never been to Portland before and really didn't know much about it beforehand. Portland is bigger, older, cooler, and way more stocked with everything fun than I expected. Fantastic food. Incredible cocktails. Great shopping. A really interesting mix of great old and great new architecture, and tons of fun old neon signs still in place and working. And everyone we met was so friendly and cool and eager to give us advice on stuff to do and see around town. Did I mention the cocktails? I can't wait to go back sometime and explore some more. Huber's Restaurant - Get the turkey dinner! !